Labeled data enables expressive computations. These same labels can also be used to easily create informative plots. xarray’s plotting capabilities are centered around xarray.DataArray objects. 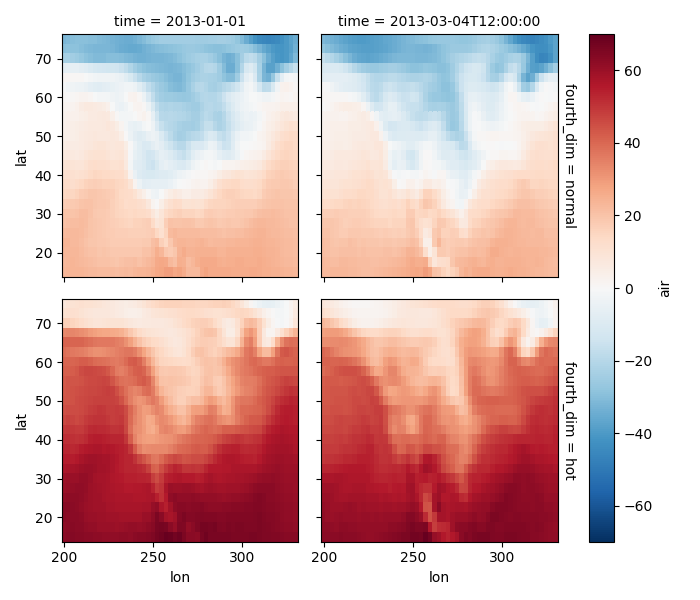 To plot xarray.Dataset objects simply access the relevant DataArrays, ie dset['var1']. Here we focus mostly on arrays 2d or larger. If your data fits nicely into a pandas DataFrame then you’re better off using one of the more developed tools there. 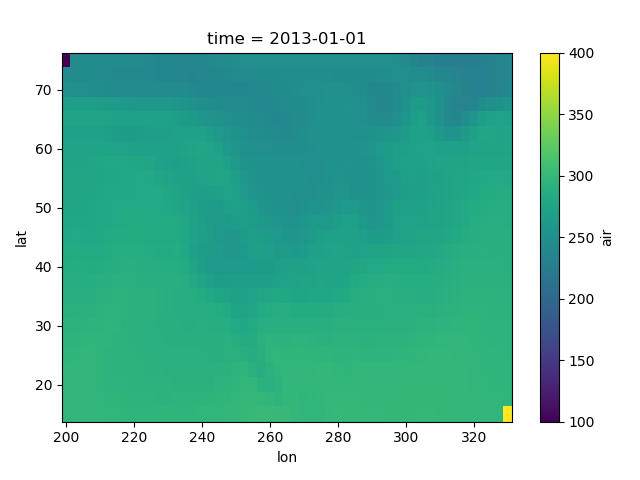 xarray plotting functionality is a thin wrapper around the popular matplotlib library. Matplotlib syntax and function names were copied as much as possible, which makes for an easy transition between the two. 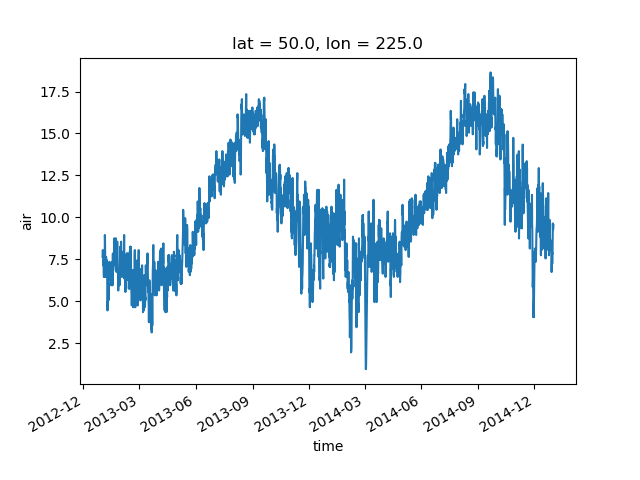 Matplotlib must be installed before xarray can plot. 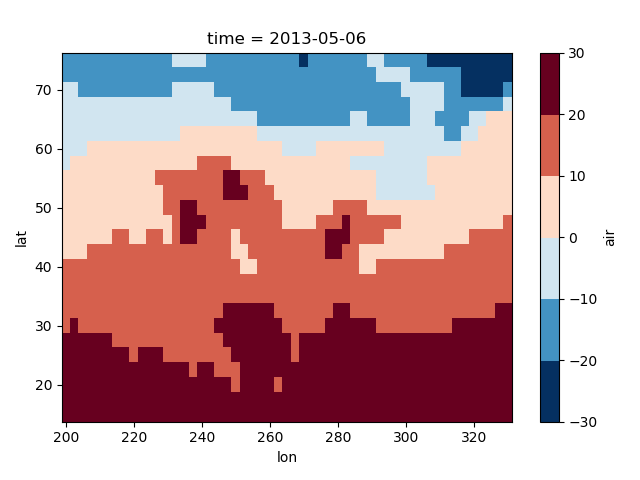 Seaborn: “provides a high-level interface for drawing attractive statistical graphics.” Integrates well with pandas. HoloViews and GeoViews: “Composable, declarative data structures for building even complex visualizations easily.” Includes native support for xarray objects. The following imports are necessary for all of the examples. 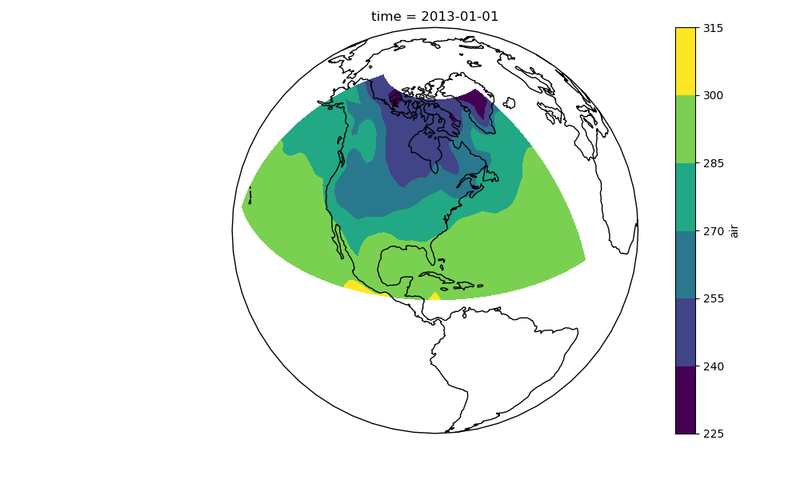 For these examples we’ll use the North American air temperature dataset. xarray uses the coordinate name to label the x axis. Not all xarray plotting methods support passing positional arguments to the wrapped matplotlib functions, but they do all support keyword arguments. Keyword arguments work the same way, and are more explicit. To add the plot to an existing axis pass in the axis as a keyword argument ax. This works for all xarray plotting methods. In this example axes is an array consisting of the left and right axes created by plt.subplots. 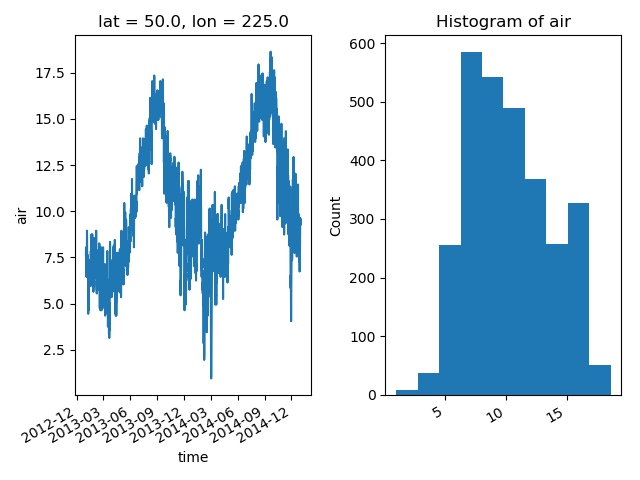 On the right is a histogram created by xarray.plot.hist(). This feature also works with Faceting. 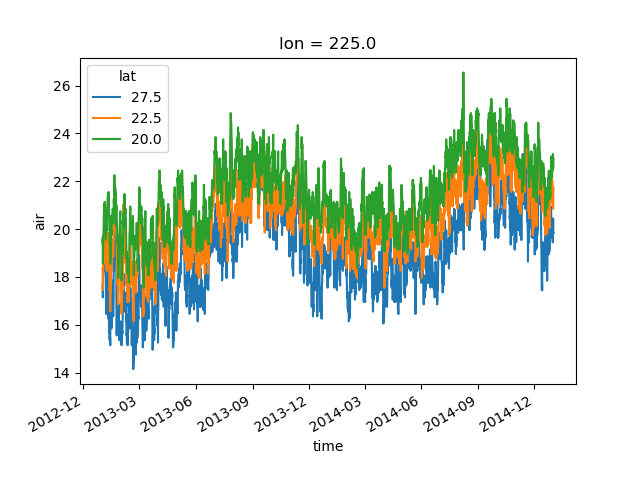 For facet plots, size and aspect refer to a single panel (so that aspect * size gives the width of each facet in inches), while figsize refers to the entire figure (as for matplotlib’s figsize argument). If figsize or size are used, a new figure is created, so this is mutually exclusive with the ax argument. The convention used by xarray (figsize = (aspect * size, size)) is borrowed from seaborn: it is therefore not equivalent to matplotlib’s. hue: the dimension you want to represent by multiple lines. 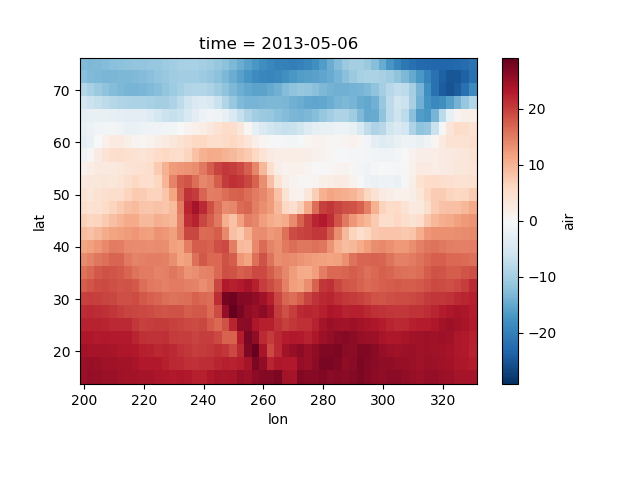 Thus, we could have made the previous plot by specifying hue='lat' instead of x='time'. If required, the automatic legend can be turned off using add_legend=False. It is also possible to make line plots such that the data are on the x-axis and a dimension is on the y-axis. This can be done by specifying the appropriate y keyword argument. The default method xarray.DataArray.plot() calls xarray.plot.pcolormesh() by default when the data is two-dimensional. All 2d plots in xarray allow the use of the keyword arguments yincrease and xincrease. 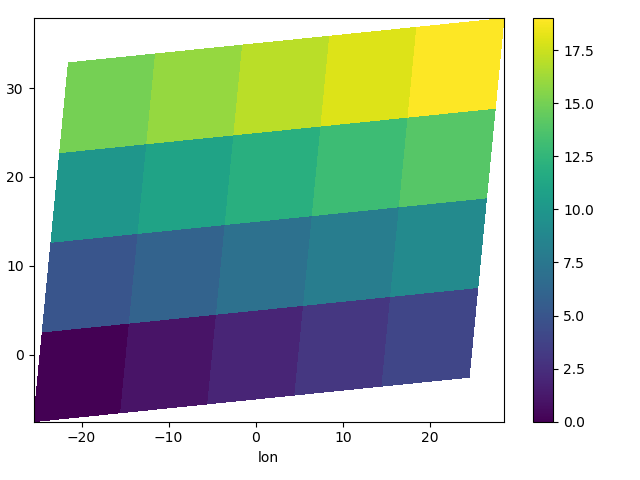 We use xarray.plot.pcolormesh() as the default two-dimensional plot method because it is more flexible than xarray.plot.imshow(). However, for large arrays, imshow can be much faster than pcolormesh. If speed is important to you and you are plotting a regular mesh, consider using imshow. xarray plots data with Missing values. It’s not necessary for the coordinates to be evenly spaced. Both xarray.plot.pcolormesh() (default) and xarray.plot.contourf() can produce plots with nonuniform coordinates. 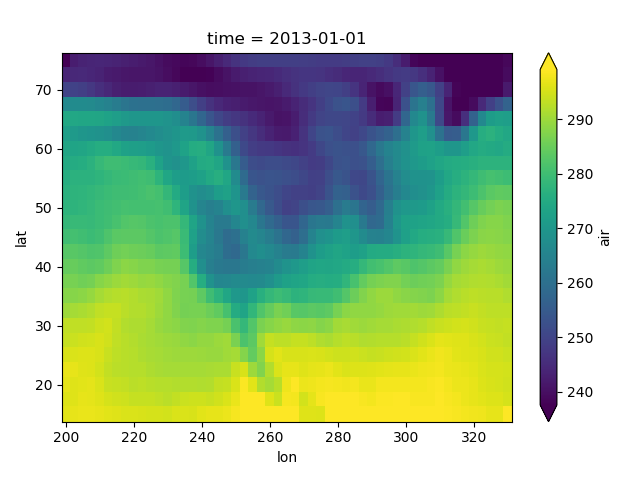 Since this is a thin wrapper around matplotlib, all the functionality of matplotlib is available. xarray methods update label information and generally play around with the axes. So any kind of updates to the plot should be done after the call to the xarray’s plot. 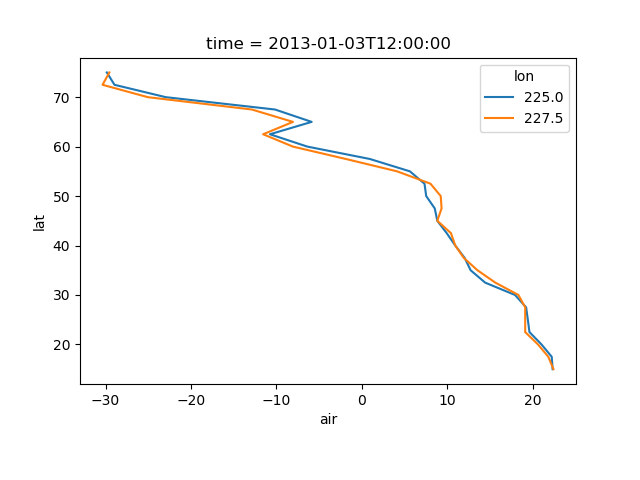 In the example below, plt.xlabel effectively does nothing, since d_ylog.plot() updates the xlabel. 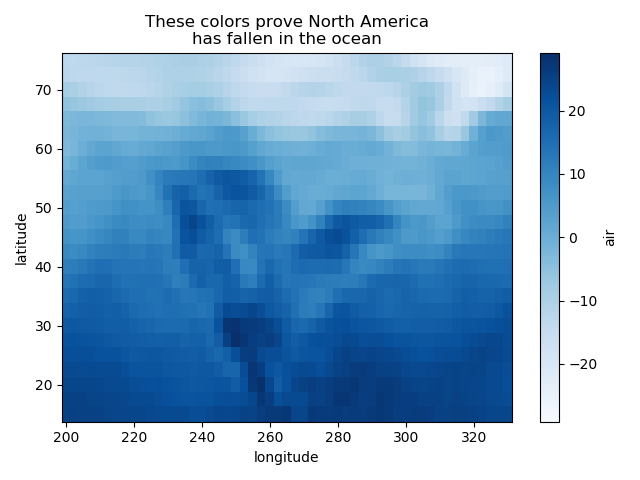 The Celsius data contain 0, so a diverging color map was used. The Kelvins do not have 0, so the default color map was used. Outliers often have an extreme effect on the output of the plot. Here we add two bad data points. This affects the color scale, washing out the plot. This plot shows that we have outliers. 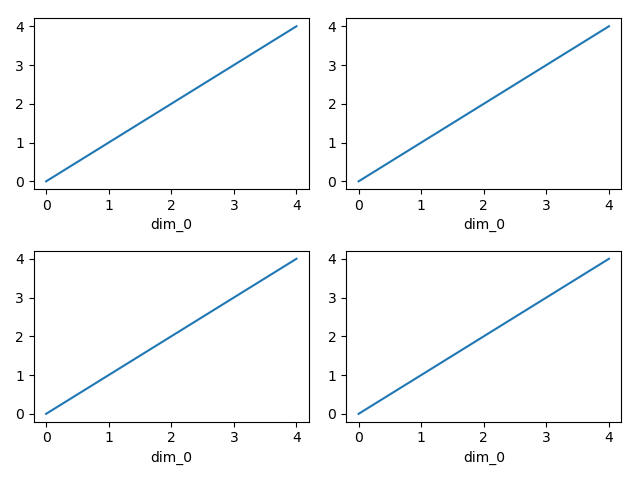 The easy way to visualize the data without the outliers is to pass the parameter robust=True. This will use the 2nd and 98th percentiles of the data to compute the color limits. Observe that the ranges of the color bar have changed. The arrows on the color bar indicate that the colors include data points outside the bounds. 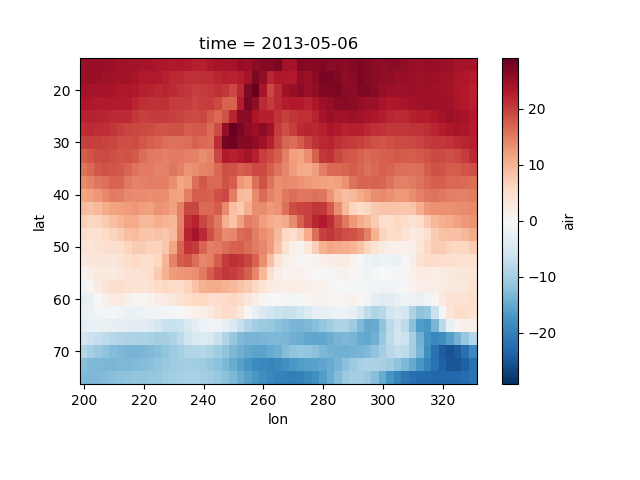 Finally, if you have Seaborn installed, you can also specify a seaborn color palette to the cmap argument. 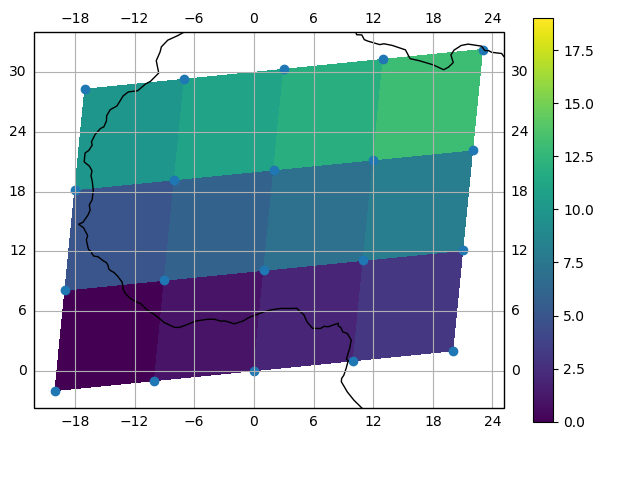 Note that levels must be specified with seaborn color palettes if using imshow or pcolormesh (but not with contour or contourf, since levels are chosen automatically). Faceting here refers to splitting an array along one or two dimensions and plotting each group. 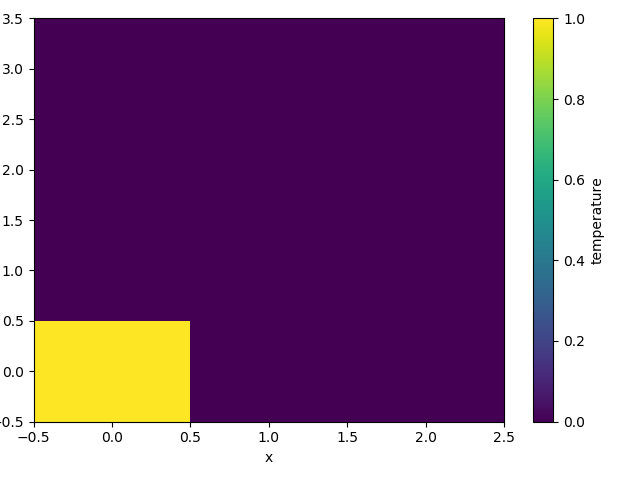 xarray’s basic plotting is useful for plotting two dimensional arrays. What about three or four dimensional arrays? That’s where facets become helpful. Consider the temperature data set. 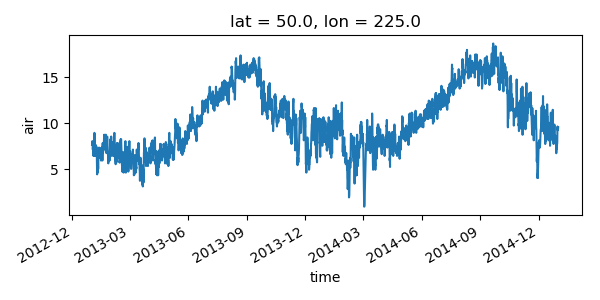 There are 4 observations per day for two years which makes for 2920 values along the time dimension. One way to visualize this data is to make a seperate plot for each time period. 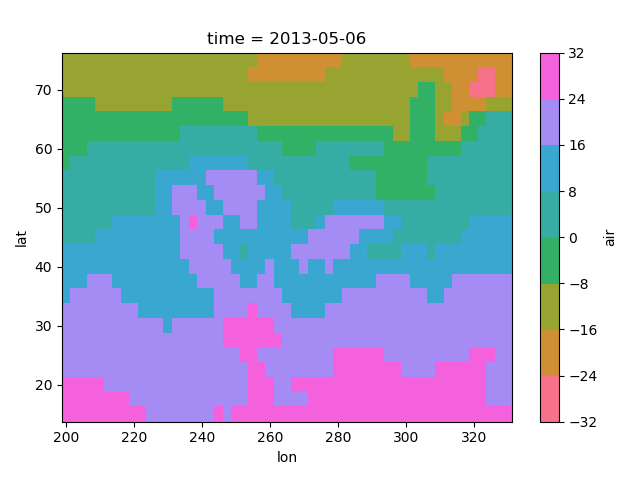 The faceted dimension should not have too many values; faceting on the time dimension will produce 2920 plots. That’s too much to be helpful. To handle this situation try performing an operation that reduces the size of the data in some way. For example, we could compute the average air temperature for each month and reduce the size of this dimension from 2920 -> 12. A simpler way is to just take a slice on that dimension. So let’s use a slice to pick 6 times throughout the first year. 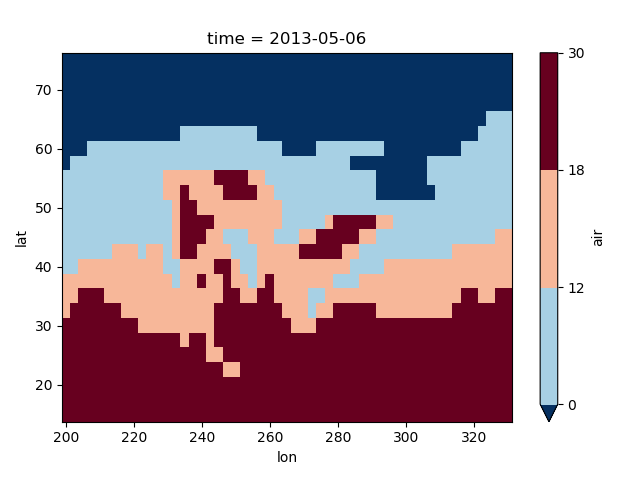 The easiest way to create faceted plots is to pass in row or col arguments to the xarray plotting methods/functions. 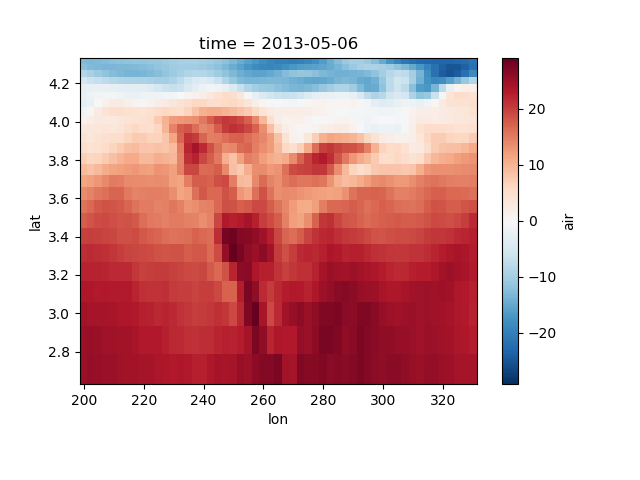 This returns a xarray.plot.FacetGrid object. For 4 dimensional arrays we can use the rows and columns of the grids. Here we create a 4 dimensional array by taking the original data and adding a fixed amount. Now we can see how the temperature maps would compare if one were much hotter. 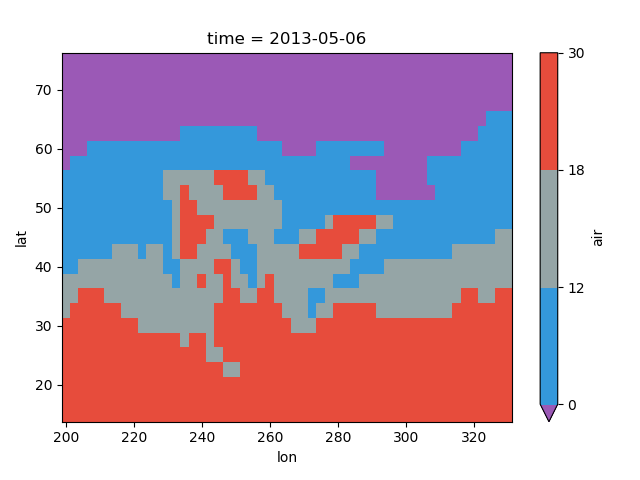 Faceted plotting supports other arguments common to xarray 2d plots. 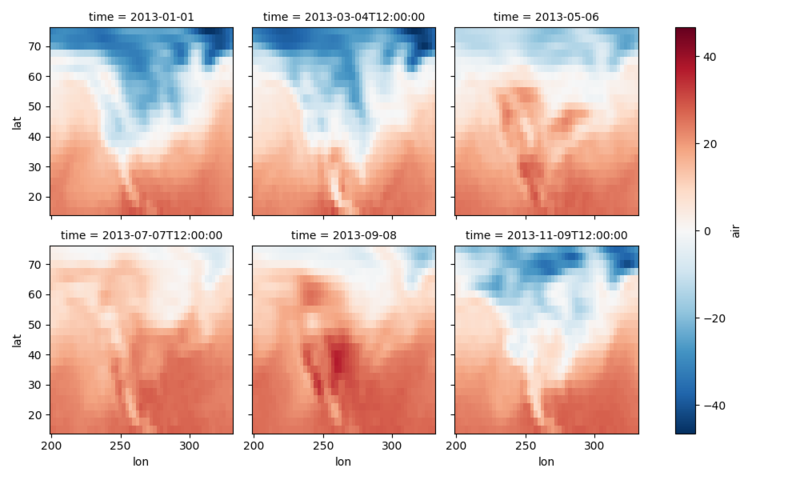 xarray.plot.FacetGrid is used to control the behavior of the multiple plots. 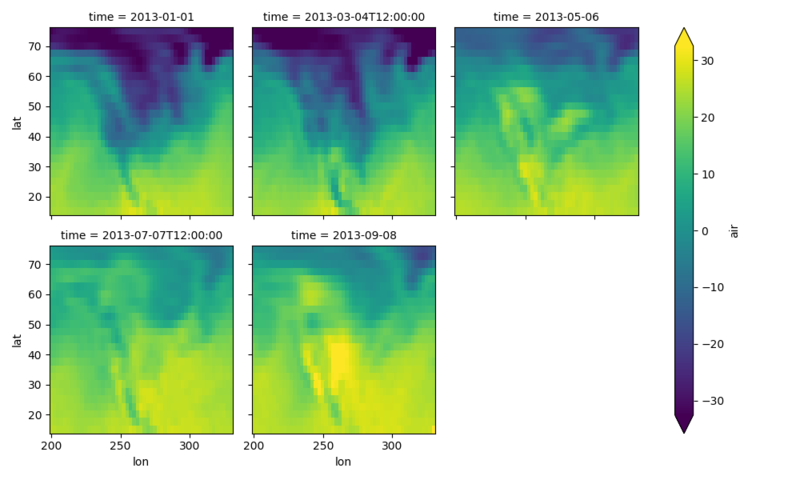 It borrows an API and code from Seaborn’s FacetGrid. The structure is contained within the axes and name_dicts attributes, both 2d Numpy object arrays. It’s possible to select the xarray.DataArray or xarray.Dataset corresponding to the FacetGrid through the name_dicts. Here is an example of using the lower level API and then modifying the axes after they have been plotted. 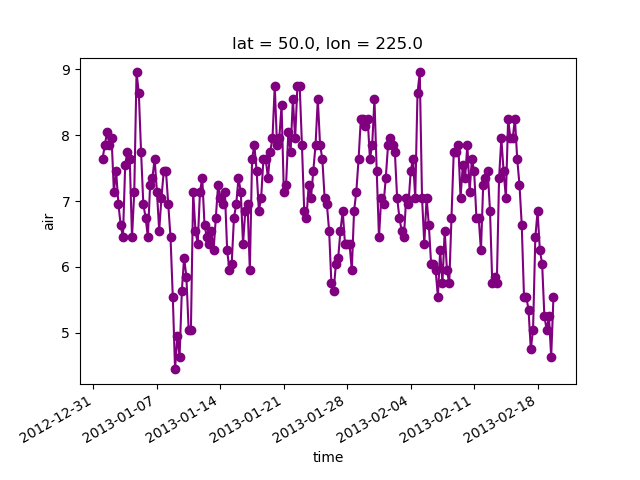 TODO: add an example of using the map method to plot dataset variables (e.g., with plt.quiver). To follow this section you’ll need to have Cartopy installed and working. This script will plot the air temperature on a map. 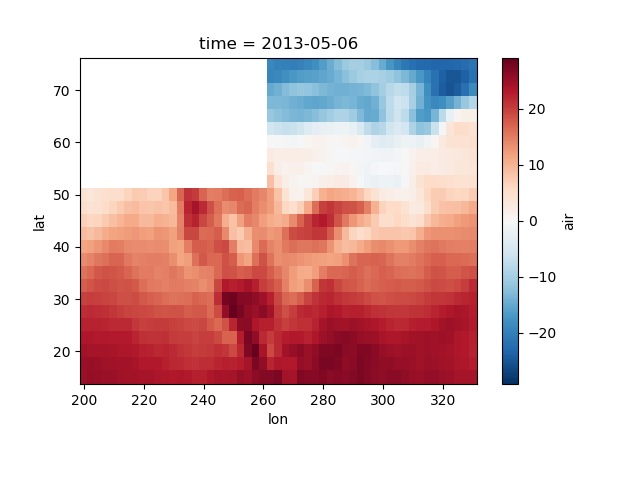 Use plot as a convenience method for a DataArray. Access a specific plotting method from the plot attribute of a DataArray. Directly from the xarray plot submodule. These are provided for user convenience; they all call the same code. Here the output is the same. Since the data is 1 dimensional the line plot was used. If you’d like to find out what’s really going on in the coordinate system, read on. The plot will produce an image corresponding to the values of the array. Hence the top left pixel will be a different color than the others. Before reading on, you may want to look at the coordinates and think carefully about what the limits, labels, and orientation for each of the axes should be. It may seem strange that the values on the y axis are decreasing with -0.5 on the top. This is because the pixels are centered over their coordinates, and the axis labels and ranges correspond to the values of the coordinates. See also: Working with Multidimensional Coordinates. The data model of xarray does not support datasets with cell boundaries yet. 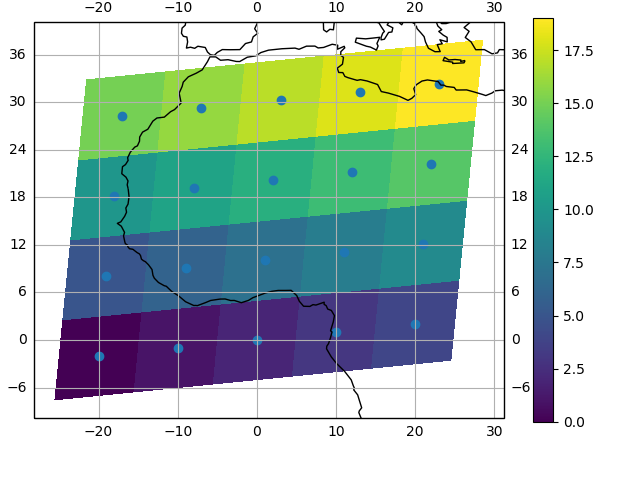 If you want to use these coordinates, you’ll have to make the plots outside the xarray framework.